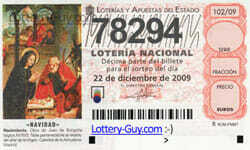 The big crazy Spanish Christmas lottery draw is now over for 2009. Life in Spain can return to normal once more – well, back to preparations for Christmas celebrations anyway. The winning number of the big prize was 78294. And winners stories are already beginning to appear. One of the big winners was a work syndicate at troubled Spanish travel company Viajes Marsans. Great news for a company who were in the process of making a large numer of their staff redundant. There are thousands of numbers, and tens of thousands of prizes with El Gord. If you want to check your numbers here’s the full El Gordo results. When the dust settles this superdraw lottery will have paid out an incredible 2.3 billion Euros to winners. Just for this one draw. It doesn’t have anything like the biggest jackpot, but it is still the biggest lottery in the world. Did you play this year? Did you win? Let us know below. Many thanks for posting the results. Yes, I am lucky winning a small sum, but missed the 2nd prize by a whisker! Have a good Christmas and a Prosperous new year.